Their system won’t be PCI compliant. Accepting credit cards through their POS would potentially put them in violation of their their insurance policy contracts. If they risk the legal consequences and keep running Windows XP, their system will be very vulnerable to viruses and worms, as Microsoft is no longer offering security patches. If client credit card information is hacked and stolen, most customers will blame them according to a recent Harris poll. In the broadest sense, the difference between ShopKeep and its major competitors like Micros, is a cloud based versus server based solution. ShopKeep offers a cloud based system that uses Apple’s iPad as the physical device that the employees running the “cash register” use to ring up sales and take payments. 1) Typically, these systems have lots of middleware that allows the various components of the POS system to talk with one another. The middleware adds complexity to the system and often causes problems and downtime. 2) Often, these systems are built in a way which makes them highly dependent on the internet. When your internet connection has problems, pc-based based POS systems tend to be useless. In these scenarios, ShopKeep will enable a merchant to keep taking cash transactions, however, even though they are not able to process credit cards. 3) Repairs and installations often require a visit from a specialist, which can be extremely costly in terms of direct costs and loss of time. In fact, Jason started ShopKeep when a technical problem with the POS that he used for his wine stores ran into a problem which shut his business down. Jason acknowledges that his firm is one of several which is offering an alternative to the traditional pc-based based POS solution. However, he believes that his firm is the best for one big reason: great 7 day per week customer service. In my interview with Jason, he said there were two basic questions which almost all potential customers ask: 1) What hardware will I need to buy? 2) Can I continue to use my existing merchant account? What hardware does one need to buy? In the case of using ShopKeep, one also needs to buy a sturdy stand to hold the tablet in an upright position. Jason estimates that the stand, the credit card reader, the receipt printer, and the cash box all told costs about $650. An iPad costs around $300. Assuming that you already have a router, the hardware costs for ShopKeep’s POS System is under $1,000. The cost of Shopkeep is $50 per month for 1 register. Can I work with my existing merchant account services provider? The answer is yes. With ShopKeep (unlike Square, Quickbooks POS, and Shopify), the client can work with the merchant account service provider of their choice, such Heartland or BluePay. There is no need to separately enter the transaction into the POS system and a credit card reader. The credit card reader is connected to an iPad, which is connected to the internet. ShopKeep sends the information to the merchant account service provider through the internet and has integration with all the major merchant account providers. ShopKeep has a major advantage over many POS systems with regards to credit cards: great security. Jason proudly stated what recently happened to the millions of Target customers, whom had their credit card information stolen, won’t happen to the businesses that use ShopKeep. ShopKeep’s credit card reader encrypts the card information during the process of reading the credit card. This information is immediately sent off to the credit card processor without being stored. In the case of Target, Jason indicates that the company was storing unencrypted customer card information on the card readers. When choosing a POS system, buyer’s should make sure that credit card information is encrypted and not stored to prevent a major hacking incident. For more information comparing ShopKeep and other POS systems see our guide here. 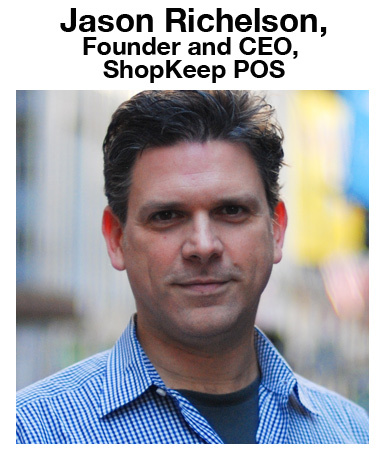 Jason Richelson is the CEO and Founder of ShopKeep POS, a provider of cloud-based point of sale software for managing retail shops and restaurants. 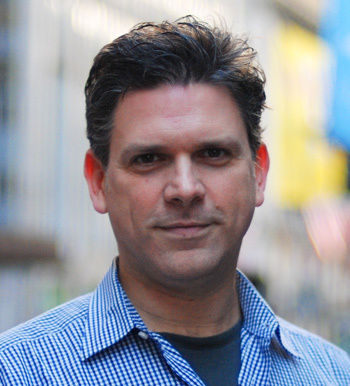 A former technology consultant and trader, Jason opened a specialty food and wine store in 2004, which he grew to employ more than 70 people in the Brooklyn and lower Manhattan branches. As a retailer, Jason had many problems with his PC-based POS system and while on vacation his store servers crashed, crippling the business. This was the turning point for Jason, inspiring him to build a more reliable, cloud-based point of sale system for small businesses just like him. Now, ShopKeep POS employees more than 100 people who all work toward the goal of empowering store owners nationwide to build and grow their businesses.